A free breakfast buffet and free parking add to the value of a stay at the completely non-smoking Fairfield Inn Beckley one of the most popular hotels in the area among our guests. For a fee you can pack your pooch for a visit to this pet-friendly hotel with five floors and 87 rooms. Sprawl out on a thick mattress crisp cotton sheets custom comforter and fluffy down pillows. You can get busy at a well-lit work desk. Make the most of your leftover lunch with an in-room microwave and mini-fridge. Rooms include cable TVs and coffeemakers. You can silence your grumbling tummy with savory breakfast sandwiches muffins and fresh fruit at the free breakfast. Busy professionals copy and fax important documents in the business center. For a little relaxation splash in the sparkling outdoor pool and then freshen up your swimwear in the guest laundry. You can also unwind with some entertainment in the game room. Parking is free. 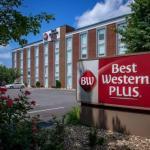 Fairfield Inn is a half-mile from I-77 putting the greater Beckley area within reach of our guests. You can learn about West Virginia's rich coal mining history at the Beckley Exhibition Coal Mine two-and-a-half miles away. Shop for local arts and crafts at Tamarack a large arts and crafts complex located less than two miles from the hotel. Golfers drive down the fairways at Briar Patch Golf Course two miles away. The hotel is 13 miles from Raleigh County Memorial Airport.